If you’re a low carb eater, you know how hard it is to find low carb sweet treats that aren’t full of processed junk and artificial sweeteners. Not to mention ones that actually taste good and don’t cost a small fortune just for one piece! I have a major sweet tooth, I don’t miss pasta and bread as much as I miss fruit and CHOCOLATE! All things in moderation, I do allow myself fruit or juice on my cheat days and I can have these peanut butter treats with CHOCOLATE, anyday! Just 3 ingredients and no baking required, these treats will satisfy your sweet tooth and not ruin your low carb lifestyle! Crush the pork rinds into about rice krispie size pieces. A food processor will make quick work of this but don’t turn them into powder! Mix the crushed pork rinds with the peanut butter until incorporated. Melt the chocolate chips in the microwave for about 20 seconds. They wont be fully melted, but stir the chocolate and it will all melt together. Don’t over heat in the microwave or the chocolate will get hard. Take a teaspoon and make 10 balls out of the peanut butter mixture. Drizzle melted chocolate over each ball. Refrigerate for a few hours until they firm and enjoy! The whole tray of 10 treats is 21 grams of carbs. The 1/4 cup of peanut butter has 12 grams of carbs, pork rinds are 0 carbs and the tablespoon of milk chocolate chips has 9 grams of carbs. Divide that up among 10 peanut butter balls and that’s just 2.1 grams per piece! Different brands have different carb totals so be sure to check your peanut butter and chocolate because your carb total might be a little more or a little less. 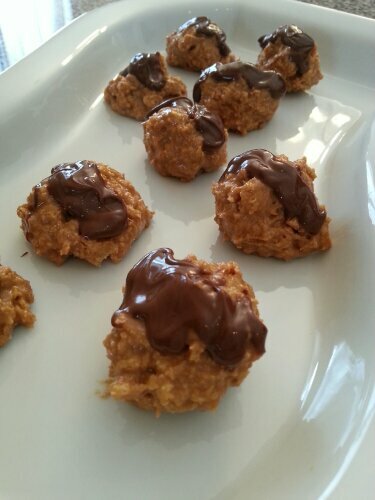 Check out my other low carb sweet treats here….